1 1/2 stars. It was almost ok. I don't like giving bad reviews. I worry that the author might see the review and I hate to hurt anyone's feelings. But there were just so many things wrong with this book, I can't help but give it a low rating.We'll start with the one positive aspect, it was a clever idea. But that's where the best of it ends. The idea was far from carried out to what I think it's potential could have been. Aleyna (sleeping beauty) had to witness some violent stuff, so to protect her, an enchanted unicorn put her under a spell. While her body sleeps, her ghost wanders around in her old castle living a life of enchanted bliss.Ok, lets stop there. It sounds like a great idea. Now when the prince comes, it won't be love at first sight, right? They will able to get to know each other emotionally without any physical contact, so the romance will seem real and developed, right? WRONG! Prince charming comes along and the first time they meet (ghost and prince) she reaches out her hand to him and he takes it and she starts to materialize and have a body and he gazes into her eyes and it is love at first sight. Literally. Ugh! There went all that potential. And then without even knowing each other, prince and Queen can't keep their hands off each other. I mean the day after they met he is nibbling her ear, and she is ok with this? If a man nibbled my ear the day after I met him, I would be so creeped out!There was absolutely no character development and all the characters were lame! There were 4 men in the book and they had no character distinctions. I never could keep straight who was who (besides the main guy of course) and I wondered why the extra guys were even in there anyway.The book kept talking about how Aleyna just needed to wait for a man to come protect her for the rest of her life and that just rubbed me wrong.Besides the lack of depth and poorly written characters, there were typos everywhere. The dialogue was unnatural and clunky. I had to re-read the things people were saying before I got what they were actually saying.So, just before I finished reading this I happened upon the authors blog and saw that she wrote and had published 13 fairy tale books in 2013. She considers this a huge accomplishment, which it is, but it isn't. It means that she has written 13 rough drafts that should be developed before being published! I don't think I'll read any more from this author and I wouldn't recommend this book to anyone, least of all impressionable young adults.And for reals, it pains me to write such a negative review. 2.5 stars (:This re-telling of the sleeping beauty is very creative..I liked it..But I cant seem to get myself to give it a higher rating :( ..Sorry.. Really, really good! That first kiss was incredible. Loved the characters, loved the twist on the story. Great, great stuff!Moral Note: Some mild to moderately heavy fantasy violence. Otherwise clean. This book is full of flat undeveloped characters, Alenya especially was a pathetic excuse--a princess who is suposed to be the chosen one but whose who purpose is to wait for another character to come fix everything (her MAN) who also spends most the book sobbing at her horrific past before being cured of that by the sexual advances of her prince. That's another thing, the book is obviously pushed to be "clean" but the exchanges between the romanctic pairing consists of them running their hands over each others' bodies and ear nibbling. Gosh if you're not going to make it steamy (which I am perfectly fine at) then keep your prince a gentleman! The big "twist" of the book is the princess's gory past which it is depicted as SO horrific yet Aleyna recovers in two days. The whoole basis of the plot is that it would take her years to recover and reintegrate into society after such trauma, well nope she's fine. The author couldn't even kill a character off properly: after a surprising (and pointless) death the character comes back to life after--opps did the unicorn forget to mention that massive spell he cast so that no one would die--ah well whats a happy wedding without a miraculous resurrection of whats-his-name? The whole book is sub-par. The basic idea is alright but it is not executed well. Another tale with a unique spin from Jenni James. This one is hard to talk about without spoiling things, but essentially...while Aleyna (Sleeping Beauty) sleeps, she doesn't know that she's under an enchantment. She goes through life as though living each day anew, never realizing that everything around her is fake and that her castle was destroyed, along with everyone she loves. When people visit her castle, they see her wandering as a ghost. Prince Darién is dared to go to the ruins with three of his friends who know he's afraid of ghosts, and the revelations that are revealed stun everyone. I thought the spin on this one was unique as well, and a careful blend of paranormal (ghosts) and fantasy (unicorns, etc.). Darién grows a lot throughout the story. His Achilles' Heel is his fear of ghosts, so the fact that he finds himself falling for the ghostly Aleyna frightens him. Only through his relationship with her can he begin overcoming his fear. There's also a new war coming as Aleyna begins to awaken. At times, there's a lot going on, but there are also more characters involved than in most of the stories in the collection. This one is really hard to give thoughts on without spoiling a lot! The cover says ‘unique, magical, and enchanting!’ and it doesn’t lie. That’s exactly what this book is. From the moment I read the description I had to read it. The princess is a ghost that walks in her own reality? We never get to see the princess when she’s asleep! How cool is that?Oh and there’s a unicorn.Anyway, this tale is pretty much in line with all the rest of the collection. It’s cute, magical, and filled with insta-love and romance. Don’t expect much character development or a sweeping story arc, just enjoy it for what it is – a fairy tale.My only concern with it is the tale has two very opposite feels to it. On the one side there’s the love at first sight which is all happy and wonderful, and on the other hand there’s DEATH DEATH DEATH. There’s no middle ground, it’s very awwww-AAAAAH. So far this series has been great for young girls, but this one might be a bit too dark to be an out-loud read. http://thedailyprophecy.blogspot.nl/2...I really liked it. Another original retelling about Sleeping beauty. I haven’t read anything with this paranormal twist before. Aleyna has been put into a sleep by the unicorn Ezralon. He is waiting for the perfect time to wake her and he is also protecting her from harmful memories. In the mean time, he let her ghosts wander in a fantasy world where she is surrounded by people.Darién is challenged by his friends to find Aleyna. There is a myth about her ghosts and Darién, despite his fear of ghosts, decides to put it to the test. He doesn’t believe the stories, until he falls in love with Aleyna’s ghosts. I liked that Sleeping beauty is in an induced sleep to keep her protected and the battle was good. Aleyna is a girl with great spirit and I liked her chemistry with Darién. It’s a pretty severe case of insta-love, but that's what you can expect from such a short fairytale. In all the fairy tales...Sleeping Beauty just lies there...beautifully sleeping!But...What if that were not so?What if Sleeping Beauty were in fact roaming the castle...Conversing with the servants...Helping the cook...Can it be?Or is it a dream...Just a dream in Sleeping Beauty's...sleeping mind?Will the Prince come and wake her...and if so...will she be able to fight off the evil Villeria?Or is living in a dream world better protection from the true world around her?An amazing retelling of a wonderful story!Jenni James is definitely one of my favorite authors!I LOVE her books! Another one of Jennie James' rewrite in her fairy tale collection. Fun read with a fun twist on this well know story. I was kinda disappointed at the end when they finally beat the sorceress. I was hoping that the enchantment would have restored the queen's castle. I've read a lot of fairy tale retellings, so I was biased when I read it. Comparing it to others, I found the story okay but not too different from the classic Sleeping Beauty story. This story was okay. I didn't think it was amazing or anything but it wasn't bad. I liked the spin on a classic fairytale but it just seemed to fall a little flat for me. loved this book to death!!! !awesome remake!! I think I enjoyed the *concept* of this book more than the actual execution. In its defense, it was a nice light read. No real depth to it, but for a few hours of reading without having to think to far, it was enjoyable.The *concept* of the sleeping princess wandering her spooky, abandoned castle as a ghost was rather cool, I will admit. I like the fact that, regardless of the fact she's sleeping, she had a *chance* to get to know her prince before the happily ever after. I even liked the creepy concept that the castle was a bit frozen in time. . .with the remains of those killed still laying about, the families possessions still there. It added to the creep factor. While I protested that it had been a 'mere' 30 years since the disaster, this supported the fact of things remaining as they were that night. (After all, if it had been 100 years, how much would have survived? I'm really not sure blood stains and fabrics would have survived even 30 years, given insect activity, but its more believable than if they had remained after 100 years. )I even liked the prince. Though a bit too much emphasis was put on how he was the best warrior in the land and no one could beat him. Then that 'fact' was not even used. What was the point of repeating it, then?After that, I found the story sort of broke down. The prince had a serious fear/phobia of the undead. A good 'weakness' for him, in this case. Yet, when they actually get to this 'haunted' castle, apart from him being 'uncomfortable' and not liking to be there - there is no further issue with the castle being haunted or ghostly. Its as if he suddenly just 'got over' his fear. While its casually mentioned a few times. . .nothing is actually DONE with it. There is no struggle for him to do what needs done, regardless of the fact he's terrified. At no point did things *really* seem to bother him. Why give him a fear, throw him into his personal nightmare. . .then do nothing with it? What really was there for him to overcome?The queen, much the same problem. She was being kept asleep to protect her mind against the horrible things she had to remember. She gets impatient, insists the prince break the curse. . .so regardless of ALL warnings that she can't handle it, he does anyway. . .and she has no real issue with it. She is able to push things to the back and deal with it later. What?? It was causing her severe distress when it was coming back, but when she doesn't remember the problem even happened, and all protections are sddenly ripped away. . .she's just fine?? (I mean, I get you hardly want to debilitate your character and make her unfit for life when you're trying to write her having a happy ever after but why set her up like that if you're not going to follow through? )Again - as seems to be my main compliant with all these books so far - the 'insta-love' . "I don't know you. We just met 5 minutes ago, but oh, you're so pretty, I just love you. Lets make out. Great, now I'm willing to die for you. Lets live happily ever after!" Ugh. Please!! I realize the story may have taken some serious tweaking to get in some actual time for a relationship. . .but the readers would appreciate believable romance!The villian. The usual 'big bad witch' wants what she wants when she wants it and of course, makes life nasty for everyone in the process. But. . .in the end. . .she seemed rather easy to defeat. There was not a ton of struggle there and suddenly all was better. I realize that it was built up so the Queen was 'very powerful'. . .but. . .it all seemed very easy.The ending. . .the princess saves her prince. Ok. Don't get me wrong. I don't mind endings where the girl does the saving instead of being saved. But it seemed like a lot of points were missed here. The prince was built up to be the hero - she needed him. He was the best fighter around and only he could do it. . . .yet, when it came down to it, apparently all that was needed was someone to distract the witch. He could have been ANYONE. What was the whole point of him? Apparently the queen had it all under control and didn't need a hero, she could do it all herself. *sighs* I would have preferred an ending where the prince actually did something USEFUL - and saved his queen. . .while the queen ALSO did something useful and saved her prince and together they finished off the threat.I did rather like the end where the friend that had been killed suddenly reappeared, unaware of what had happened. It was a little. . . convenient, but I kind of liked it. We can overlook the convenience for a minor character. :) All in all, I did enjoy the story, but the 'problems' made it hard to sit through without wanting to scream. I found so many parallels between Alyena finding out all that she didn't recall from her past and having to act based off info she is given from others, to when an individual is advised to sacrifice something now for something better later, i.e. forgoing premarital intimates in order to be blessed more abundantly in marriage. "Excerpt from the novel: "Patience little one, it will come--you will understand all--and you will be able to hold his hand for as long as your heart's content, just wait. Wait. And you will understand why... Do not question right now. Listen. Do not think. Do not overanalyze... just know this is all for your own good. You have accepted my counsel and advice since you were a little girl, do not allow your frustrations to overrule my advice. Keep your head clear." Surprised how it took me exactly a month to finish. My time spent reading this was very pleasant tho and I'm actually interested in slowly checking out the rest of the series. It was fast paced for the most part. And cheesy. Loved a lot of it, but gave it three stars due to grammar errors and dragged out bits that made my eyes roll those are for now important things for my reading experience as well as how accessible it is to read. Usually not a person who goes for this type of read but i am glad i did in this case. Personally gave me some Twilight-like nostalgia that i completely ate up cause it was just what i needed at the time. This book was terrible. Why was it so awful, you may be wondering? Well, here are some adjectives to describe this book: boring, stupid, cheesy, awkward, slow, and weird. Plus, for a retelling if Sleeping Beauty, not a lot of facts were right. The Princess should’ve been 16, not 18, and she should’ve pricked her finger. Also, she should’ve been asleep for 100 years, not 30. This book was terrible and if you want to keep saying you enjoy this fairy tale, don’t get any closer to this book. I liked that this book was a bit different than the usual Sleeping beauty story but there is no depth. The characters are shallow with no real difference in their slight personalities. The story had tons of holes and no real explanation for the characters motivation. Overall a rather disappointing quick read. A captivating twist on a classicI loved this book so much, and I am super excited to buy the other ones! The twists on the classic fairy tales are so entertaining and captivating! Definitely buying another one, although I don't know which! There are so many interesting looking ones! This book was beyond strange. It was hard to get through and I didn't like the plot. Aleyna was put to sleep after witnessing her whole family being murdered. The problem is that she needs her prince to wake up and someone with a lot of evil power is waiting for just that. 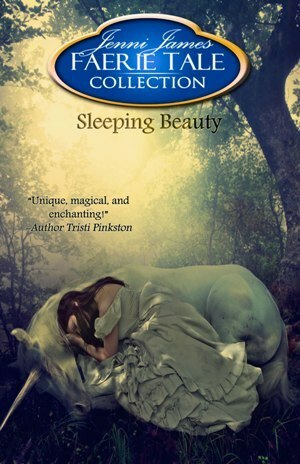 Sleeping Beauty by Jenni James Note: While this is Book 2 in the collection it works just fine as a stand a lone.Aleyna has been asleep for decades. The evil enchantress Valeria destroyed her kingdom. The good unicorn wizard Ezralon put Aleyna under a sleep spell to protect her. Now her ghost haunts her ruined castle, though she sees it only as it was when she was awake and living there. Ghost servants assist her in her daily needs and do their best to keep her company. In a nearby kingdom, Darien, brother to King Michael, has taken a bet to explore the ruins and confront the ghost. Darien has an unusual fear of the supernatural, so this dare will not be an easy one to see through to the end.Ezralon was my favorite character. He’s a gruff old wizard, and also a unicorn. The inherent opposites of those two things tickled me to no end! I also love that he’s protective of Aleyna but also willing to help the right person bring her out of her sleep.Aleyna was pretty so-so for me. She’s not had much real world experience but she’s still got a little too much fluff between the ears for my taste. She needs assistance with nearly everything for much of the book, though she does have one or two moments when she rises above and accomplishes something. She has these PTSD moments when her memories of the past come back to her and I felt these scenes were given the most weight, defining the character, and making her rather dependent on others. I didn’t feel that she was the hero of the story at all. Darien has a little more meat to him than Aleyna. He falls in love easily and is very chivalrous, etc. That was to be expected and came off as vanilla bland.Darien’s crew (young noblemen who came with him on this dare) agree to protect Aleyna and her crumbling castle from the hoards of bad things Valeria has brought with her. MILD SPOILER Aleyna has a power of her own that she isn’t fully aware of, but Ezralon and Valeria are. So Ezralon advises Aleyna to use that power to surprise Valeria while Darien and crew make ready for a stronger defense of the castle. This super power is looking extremely fantastic, like radiant, in a nice dress. Yep. END SPOILER. I was pretty disappointed on that one. Really? That’s her special ability? Argh!Over all, the story was a little too happy and Disney-esque for me. It does have a full story arc and there’s no gaping holes. Yet I wanted more out of the main character Aleyna, a lot more really. In the end, I felt that Valeria had a very bad day and was totally off her game and that had she taken the time to have a cup of coffee, she could have easily defeated Alyena and crew. I do really like Ezralon and hope that he gets his own story one day.I received a review copy at no cost from the audiobook publisher in exchange for an honest review.The Narration: Karen Dotrice’s performance was pretty good. She had several different character voices with accents and she was great on getting emotions across to the listener. However, whenever Darien was shushing Helena in comfort, it was just a bit too much sssshhhhhh, to the point where I had to turn down the volume. Also, the name pronunciation wasn’t always clear to me – Helena? Alena? Ezrilond? Ezrimond? It was ok. Kinda cheesy.